Jace after going for a walk with the dogs on a sunday afternoon. Da fällt mir nur folgendes dazu ein ... G R A N D I O S !! Wenn Du mal etwas Zeit hast würde ich mich freuen wenn Du mir mal Stichpunktartig Dein Postprocessing erläutern würdest .. aber nur wenn es kein Geheimnis bleiben soll. Habe die ganze Woche schon auf ein Bild von Dir gewartet. Na das Warten hat sich gelohnt!! Hallo Marta, einfach fantastisch. Dein Postprozessing ist wirklich einmalig. Es waere sehr interessant, erstens das original zu sehen und zweitens einen kleinen Einblick in dein pp zu bekommen. Und ich muss es nochmal sagen, das Bild ist einfach super, sowas von vertraeumt, die Stimmung kommt super rueber. Dankeschoen. Beautiful image. Very dreamy. A bit a pity that here eyes are closed. sooooooooooo beautiful!!! I don't know how you create this effect, but it really works excellently! aquesta m'agrada molt, es bucòlica i tal, molt ben composada, el processat perfecte!! Love the softness of the grasses and the image. Where are the dogs? Una imatge fantàstica. Amb aquest efecte suavitzat que tant be saps aconseguir a les teves fotos i que m'agrada tantíssim. Preciosa. Sembla una pintura, darrerament fas uns processats impressionants. This capture has an unbelievable vividly impression - just like a 3D effect. Fantastic. one of your best in recent times. Beautiful soft colors. Wow! The light is so soft and gold! Quina imatge mes maca! te el grau just de processat i la captura es genial. Tot plegat em fa una sensació d'innocència i alhora grandaria. cant really add much more to what's already been said... wonderful! really great, desparate to learn how to get such image if you can share..
Li has tret el suc a aquest camp de blat... un retrat molt bonic i espontani,amb un tractament molt suau i delicat. This is truly a stunning portrait. Just lovely. What a stunning portrait. The processing is bringing it home. Exposure, composition and color is perfect in this one. Keep them coming! Wonderful shot! It looks like a painting! Fantástica Marta. Magnífico trabajo de procesado para una imagen fresca y tierna. Me encanta. stunning shot. Seems dreamy, innocent. perfect capture. un tractament collonut...no se com ho fas...pero...sincerament, et tinc bastanta enveja. Wunderbare Szene und absolut perfekte Bearbeitung. This is the best picture I have seen today. Beautiful art. great shot. I think you got the right color tones for thi picture. Composició i tractament posterior fabulós, un treball magnific, et felicito. 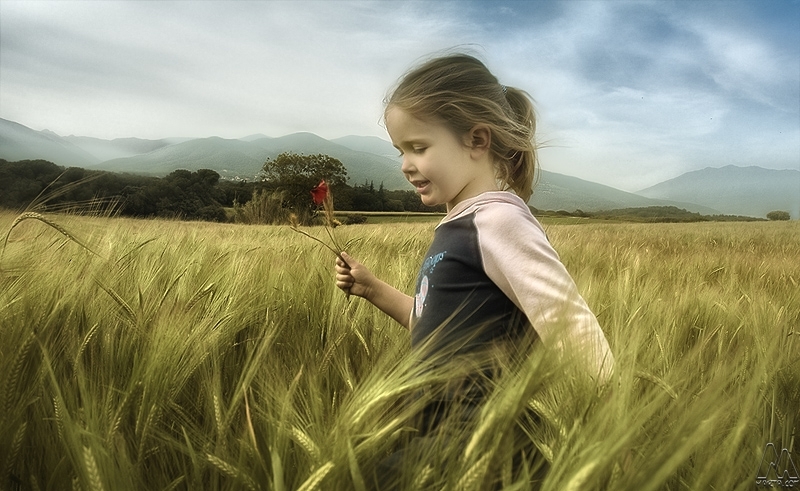 Jo, que preciosidad de foto, casi se puede sentir el viento con el movimiento de las plantas y la niña, excelente el tratamiento tan suave ..... Que envidia , porras ! love the structures and colors and what a lovely girl! Just a stunning shot...such clarity and style with perfect light and a perfect composition. One of the best shots I've seen in a while. Bravo. Thank you all! For those of you who asked about the post-processing, I will try to write a tutorial as soon as my schedule frees-up a little. So beautiful and soft, I love every aspect of it. wonderful portrait & a beuatiful girl! Esta la encuentro genial. El escenario, el gesto y la imágen idílica del campo de trigo. El hecho de que esté bien cerca y sin mirar a la cámara, en actitud relajada hace todo más natural. wow, this shot is beautiful!! what a lovely dreamy effect..and that colors are great!! you have a great photoblog! Joyful, great. Love your kid shots and post.